Today was the first day of Microsoft’s annual conference Ignite, which covers not only SharePoint and Office 365, but also Azure, Windows, Dynamics 365 and other Productivity related Microsoft Products. 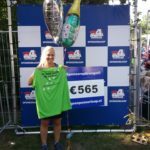 In this post I will summarize a couple of my personal key take-aways. During the Keynote Satya had a strong emphasis for Mixed Reality, Artificial Intelligence and Quantum Computing. And where this really comes together is in one of the new main topics of Microsoft. It used to be only about achieving productivity through collaboration, but with all the new devices and technologies, it’s now also about achieving more through enabling creativity. e.g. Add your 3D image to your PowerPoint and let the morph function animate it, between slides. Or let your Hololens Users design together in a mixed reality, and even allowing non Hololens users to participate and view recordings of the session. These are just two of the many examples shown. But of course not every employee in your company will be designing products in 3D. Also for the ‘regular’ office worker a lot of enhancements have been announced. What’s important to mention is that Microsoft has a new mentality when designing products the last couple of years. Instead of creating beasts of applications, that can do anything for everyone, they now have “purpose build tools”. 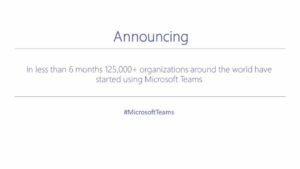 And one of their major tools launched this year is Microsoft Teams, the digital hub for team work. By providing integrations to a lot of Microsoft and 3rd party services, it can become the starting point for teams. Next to collaborating on documents, it also provides a way for threaded consistent conversations within your team. And announced today: it will be Microsoft’s Hero Client for Communication. What does that mean? Simple speaking, they are adding a lot of Skype functionalities to Teams, so you can do your communications through one app. One of the really cool functionalities they showed are meeting recordings automatically saved to your team environment, for anybody that couldn’t join, (or didn’t pay attention) to view it afterwards. We now have guest access in Microsoft Teams. This means that also our external users can participate. The OneDrive sync client now has files on demand. This means that your synced files with not automatically download to your device and use up all of your disc space. Instead stubs will be visible, and they are only downloaded when being opened. The Excel Client finally supports co-authoring. So finally we can work with multiple people people in the same document at the same time in all of our Office Applications. In Excel you can even see in which cell your colleagues are editing. Finally. They also proudly demonstrated the new Communication Sites, which are just beautiful. And we have seen the new Productivity Library. The place to explore the different functionalities of Microsoft 365. Another really cool thing I’ve seen to day is Bing for Business. Shortly summarized this means that when a user opens bing search, and is logged in there with his Office 365 identity, the search results will not only show web results, but also from your own Office 365 tenant and LinkedIn (all data available via Microsoft Graph). Of course, all results are security trimmed, just as we are used to from SharePoint Search. Also, like SP Search, you can created promoted results, for e.g. Employee Handbook or other general resources. 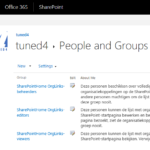 Tomorrow we expect more announcements specifically for SharePoint and OneDrive.